What Is DA Form 3540? DA Form 3540, Certificate and Acknowledgement of Service Requirements and Methods of Fulfillment in the U.S. Army Reserve is a form signed by individuals joining the U.S. Army Reserve to signify their acknowledgment of their military obligations and participation requirements. A new edition of the form - sometimes incorrectly referred to as the DD Form 3540 - was released by the Department of the Army (DA) in June 1983. An up-to-date fillable version is available for download below or can be found through the Army Publishing Directorate website. The form must be completed and signed by all soldiers enlisting and reenlisting in the U.S. Army Reserve as well as those transferring or reassigned to a Reserve troop program unit or the Individual Mobilization Augmentation (IMA) Program. How To Fill Out Da Form 3540? For use of this form, see AR 135-91; the proponent agency is DCS, G-1. AR 135-91 and AR 600-8-104.
unsatisfactory participation action if requirements are not met. The DoD Blanket Routine Uses may apply to this collection. Individual Mobilization Augmentation (IMA) Program. conjunction with enrollment in the Senior Reserve Officers' Training Corps (ROTC) program. of the signed enlistment/reenlistment document (DD Form 4 Series). responsible for reading and explaining the service requirements and methods of fulfillment set forth below. the Soldier's Army Military Human Resource Record (AMHRR). satisfaction and understanding before proceeding. b. If you are being transferred or reassigned to a troop program unit or IMA duty position of the U.S.
Army Reserve, an exact copy of this explanation will be inserted in your military records. c. I will furnish you a copy of this signed and witnessed statement. service date in the Selected Reserve. WITH A REMAINING STATUTORY MILITARY SERVICE OBLIGATION . unfulfilled portion of my current statutory military service obligation. period of my statutory or contractual obligation, whichever is longer. although additional delay may be necessary for military reasons. and remain on IADT for completion of such alternate training. not available I will be subject to reassignment to the Individual Ready Reserve. 2. ENLISTMENT/REENLISTMENT WITH PREVIOUS SERVICE OR CURRENTLY IN SERVICE . required to enter on a period of active duty for training (ADT) to become qualified. Selected, Ready, or Standby Reserve (Active List). 3. TRANSFER/REASSIGNMENT TO A TROOP PROGRAM UNIT OR AN IMA DUTY POSITION . obligation, whichever is longer, unless sooner removed by proper authority. or complete the entire period of annual training I will be determined an unsatisfactory participant. correspondence that I may receive. assignment orders until reassigned or separated by proper authority. absence during any continuous 365-day period. will be declared an unsatisfactory participant. muster, when so ordered, I will be determined an unsatisfactory participant. The form consists of 12 sections in total and structured as a checklist. All pages of the form except for the first one must feature the last name of the applicant and the last four digits of their SSN. Section I defines the applicability of the form and provides information on the categories of personnel required to file. Section II contains the specific procedural instructions for three different types of eligible Soldiers. Soldiers enlisting or reenlisting in the USAR, for instance, must have their completed and signed DA 3540 stapled to each copy of their DD Form 4, Enlistment/Reenlistment Document - Armed Forces of the United States. Section III provides an explanation of service and participation requirements by the witnessing official. Section IV is for the Soldier to confirm their service obligations. The applicant must pick out the applicable transaction and initial the box next to the option they've chosen. Section V is for selecting the applicable set of guidelines of service based on the specific reasons for enlistment, transfer or reassignment. Section VI - Satisfactory Participation - provides a set of rules and guidelines that the applicant must swear to fulfill in order for their service to be considered satisfactory. Section VII lists all possible outcomes of unsatisfactory participation. Section VIII describes the obligations of active duty orders and possible mobilization. Section IX provides the option to make additions or changes to the already completed certificate. Section X is for the applicant to verify that all the above-mentioned guidelines were read out and explained. The applicant must certify that their service obligations have been made clear to them and they are willing to fulfill them satisfactorily. Section XI is for verification from the witnessing official. 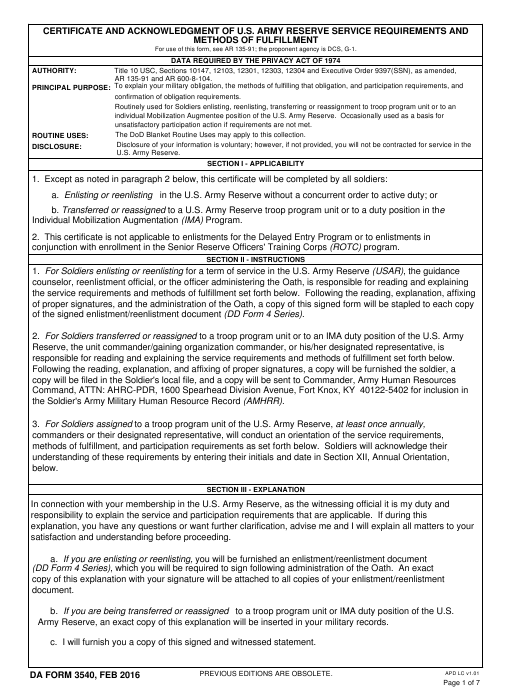 Section XII contains annual orientation check boxes for the Soldier's to sign after annual orientation sessions.